This blog was originally posted on January 7, 2016. We’re always interested to learn how districts adopt and implement the EiE curriculum. One challenge many districts face is simply finding the funds for curriculum materials, another is building consensus and enthusiasm among teachers. Amphitheater Unified School District in Tucson is a great example of a district that’s seeing a highly successful EiE implementation despite serious budget constraints. 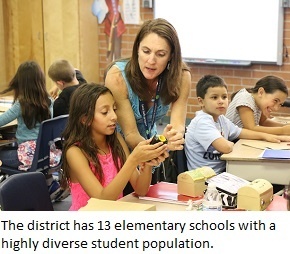 Amphi is Tucson’s third largest public school district, and it’s notably diverse. Covering a 110-square-mile region, it includes inner city, suburban, and rural schools. The student population is socioeconomically and culturally diverse; at some schools, almost all students receive free and reduced lunch, at others, almost none do; close to 50 percent of students in the district are Hispanic; and a significant number of students are refugees from war-torn nations in Africa. The district’s 13 elementary schools are even diverse in the way they are structured! Ten are traditional elementary schools serving grades K–5; one is a K–6 school; and two are in K–8 facilities. Altogether, Amphi has about 7,000 elementary students. 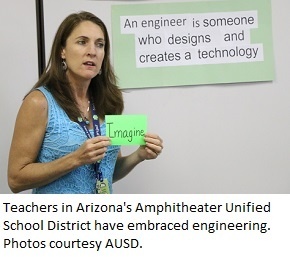 In 2014, Amphi made a commitment to re-energize STEM education in its elementary schools. Over the course of a year, educators developed science guides mapped to state standards, and included design thinking as an element in these guides. 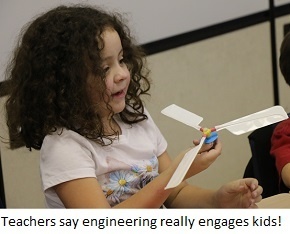 But initially, integrating engineering with elementary instruction wasn’t an express goal; instead, Dr. Roseanne Lopez, chief academic officer for elementary education, was tasked with launching engineering instruction for middle school students. 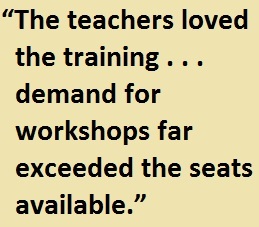 By the end of 2015, more than 100 of the district’s nearly 350 elementary teachers were prepared to teach with EiE. Lopez was also able to send three particularly enthusiastic teachers to an EiE Teacher Educator Institute—a train-the-trainer workshop that qualified them to facilitate EiE workshops for still more Amphi teachers. But they couldn’t afford the EiE materials kits. During the Great Recession, Arizona cut state funding for schools drastically—more than any other state. Between 2008 and 2014, per-student funding declined more than 23 percent. Other schools approached private donors. Still others looked hard at their budgets and somehow found funding. Raytheon Engineer to the Rescue! Meanwhile, a retired Raytheon engineer who lives in the district heard about the EiE implementation and contacted Lopez to offer more help. Rosemary Badian had previously coordinated programs to bring Raytheon volunteers into Tucson-area districts where the company supported EiE implementation through the Raytheon–EiE scholarship program, a component of a $2 million, five-year initiative to jumpstart the use of EiE in high-needs schools and districts. Badian organized a group of volunteers to come to Amphi’s Keeling Elementary, an inner-city, high-poverty school, for “STEM Thursdays.” Each week this past fall, five to ten volunteers have turned out to prep the materials needed for the day’s EiE lesson—for example, assembling milk-carton windmills for the Catching the Wind unit. The volunteers also assist in the classroom. One school that has adopted EiE in a big way, Walker Elementary, was named Southern Arizona STEM School of the Year at the 2015 Southern Arizona Research, Science and Engineering Foundation (SARSEF) Fair. One award-winning student is fifth grader Kaylynn Calvin, who designed and built a glove that protects your fingers from needle sticks while sewing. EiE designs each engineering activity to connect with student’s real world experiences, so we were impressed to learn that Kaylynn connected her engineering work to her family’s Navajo crafting traditions. She’ll go on to compete at the state level. We designed EiE with this express goal in mind . . . but it’s feedback we always love to hear.